The Type VIIC was the workhorse of the German U-boat force, with 568 commissioned from 1940 to 1945. Boats of this type were built throughout the war. The first VIIC boat commissioned was the U-69 in 1940. The Type VIIC was an effective fighting machine and was seen almost everywhere U-boats operated, although their range was not as great as that of the larger Type IX. The VIIC came into service as the first "Happy Time" near the beginning of World War II was almost over, and it was this boat that saw the final defeat by the Allied anti-submarine campaign in late 1943 and 1944. Type VIIC was a slightly modified version of the successful VIIB. They had very similar engines and power, and were larger and heavier which made them slightly slower than the VIIB. Many of these boats were fitted with snorkels in 1944 and 1945. They had the same torpedo tube arrangement as their predecessors, except for U-72,U-78,U-80,U-554, and U-555, which had only two bow tubes, and for U-203, U-331,U-351,U-401,U-431, and U-651, which had no stern tube. On the surface the boats (except for U-88,U-90 and U-132 to U-136 which used MAN M6V40/46s) were propelled by two supercharged Germaniawerft, 6 cylinder, 4-stroke M6V 40/46 diesels totaling 2,800 to 3,200 hp (2,100 to 2,400 kW) at 470 to 490 rpm. 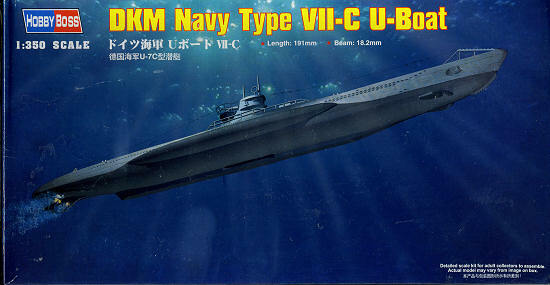 Perhaps the most famous VIIC boat was U-96, featured in the movie Das Boot. 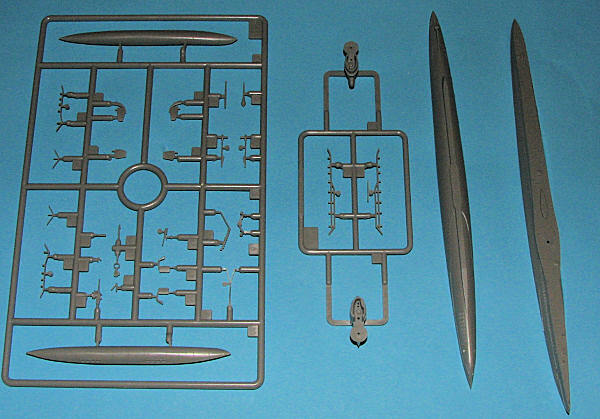 Molded in Hobby Boss' usual grey plastic, the kit has a separate hull so if so inclined, though it may take extra work, you can build a waterline version. Two different conning towers are provided and you can apparently use either one. The finely molded bits on one fret come wrapped in foam sheeting to keep them intact, a very nice touch that you'll find in some other Hobby Boss kits. There are two photo etch frets included. One is used to build up the display stand, while the other offers replacements bits and pieces for those items provided in plastic. Aside from the stand, the conning tower deck and rear tub rails, the builder can leave off much all the rest of the photo etch and still have a complete kit. Instructions are well done and show what optional pieces are available. There is a full color painting guide that offers a variety of paint choices. Neither one of the boats is identified. For the box art boat, the grey will need to be mixed, though there is no mixing formula provided. The other boat has a partial tiger stripe scheme on the upper hull sides. The small decal sheet (not shown) provides flags and small conning tower markings. Overall, the boat looks to be a pretty simple and straight-forward build. The photo etch parts add some additional interest and in several instances are better sized than the plastic ones. Regardless, it will make a great boat model to add to one's collection. My thanks to Squadron Products for the preview kit. Get yours at your favorite shop or ask them to order it for you.